I am pleased to report that Alphonso Johnson will receive the 2010 Bass Player magazine Lifetime Achievement Award. The ceremony will take place on Saturday, October 23 at the evening event of Bass Player LIVE! 2010, after which Alphonso will perform along with David Garfield, Mike O’Neill and Leon “Ndugu” Chancler. Alphonso is best known to Zawinul fans for his two-year stint with Weather Report. He first came to Joe and Wayne’s attention in 1973, when Weather Report shared a bill with Chuck Mangione in Johnson’s hometown of Philadelphia. Alphonso was Mangione’s bass player at the time and Wayne and Joe liked what they heard. They later invited him to audition during the recording of Mysterious Traveller. He had just turned 23 years of age. In addition to Chuck Mangione and Weather Report, Alphonso has performed or recorded with Santana, Woody Herman, The Crusaders, Bob Weir, George Duke, En Vogue, Wayne Shorter, Sergio Mendes, Tony Williams, Joe Williams, Gregory Hines, Eddie Henderson, Flora Purim, Quincy Jones, Lee Ritenour, Phil Collins, The Whispers, John McLaughlin, Jeffrey Osborne, Sarah Vaughan, Dori Caymmi, Carl Anderson, and The Meeting. He also has three albums under his own name. Alphonso is also a music educator, and he is currently on the faculty of the University of Southern California Jazz Studies Department. Bass Player LIVE! is an annual two-day event that “brings players, manufacturers, and artists together in an intimate environment for hands-on access to the latest instruments, equipment and instruction on playing technique and application.” Previous recipients of the Lifetime Achievement Award include Charlie Haden, Rocco Prestia, Tony Levin, Lee Sklar, Verdine White, Anthony Jackson, Will Lee, Oteil Burbridge, Leo Fender, Percy Heath, Milt Hinton, Jerry Jemmott, Al McKibbon, Joe Osborn, Chuck Rainey, Bobby Rodriguez, and Billy Sheehan. Congrats to Alphonso. If you’re in L.A. in October, get out to the Key Club and give him his props. Ever since watching video of the Metropole Orchestra performing the music of Joe Zawinul, I’ve been hoping that these recordings would be officially released on CD, if not DVD. Now such a CD is in the offing. 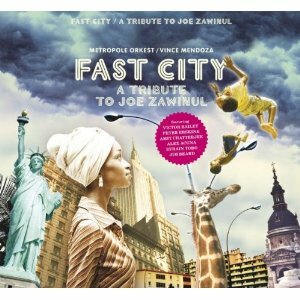 BHM Records has announced that it will release Fast City, a tribute to Joe Zawinul performed by the Metropole Orchestra under the direction of Vince Mendoza. The release is scheduled for Germany in October. If past practice is an indicator, a US distributor won’t pick it up until many months later, although AbstractLogix frequently stocks import CDs for purchase in the US. I wrote about the orchestra’s Zawinul tribute in April 2009. The orchestration and performances are amazing. Mendoza is a gifted orchestrator and his empathy for Zawinul’s compositions makes for transcendent music. Songs such as “Peace,” “Jungle Book” and “Nubian Sundance” are noteworthy both because one wouldn’t expect to ever hear them played live, but also for the way in which the Metropole Orchestra reveals layers that extend beyond the original recordings by Joe and Weather Report. Fast City will consists of six tracks recorded on January 26, 2008 at the Concertgebouw in Amsterdam. The remaining three tracks were recorded live at the North Sea Jazz Festival on July 11, 2008. Guest artists on both occasions included Peter Erskine, Amit Chatterjee, Victor Bailey, and Jim Beard. Alex Acuña plays percussion on the Concertgebouw tracks while Efrain Toro handles percussion on the North Sea recordings. 1. “Jungle Book” (07:39) – Joe Zawinul/ arr. Vince Mendoza. Recorded January 26, 2008 at the Concertgebouw in Amsterdam. 2. “Orient Express” (09:32) – Joe Zawinul/arr. Vince Mendoza. Recorded July 11, 2008 at the North Sea Jazz Festival. 3. “The Juggler” (05:24) – Joe Zawinul/ arr. Vince Mendoza. Recorded July 11, 2008 at the North Sea Jazz Festival. 4. “Nubian Sundance” (10:29) – Joe Zawinul/ arr. Vince Mendoza. January 26, 2008 at the Concertgebouw in Amsterdam. 5. “Dream Clock” (07:37) – Joe Zawinul/ arr. Vince Mendoza. January 26, 2008 at the Concertgebouw in Amsterdam. 6. “Fast City” (06:07) – Joe Zawinul/ arr. Vince Mendoza. Recorded July 11, 2008 at the North Sea Jazz Festival. 7. “Peace” (11:05) – Joe Zawinul/ arr. Vince Mendoza. January 26, 2008 at the Concertgebouw in Amsterdam. 8. “Tower Of Silence” (06:47) – Joe Zawinul/ arr. Vince Mendoza. January 26, 2008 at the Concertgebouw in Amsterdam. 9. “In A Silent Way” (04:20) – Joe Zawinul/ arr. Vince Mendoza. January 26, 2008 at the Concertgebouw in Amsterdam. 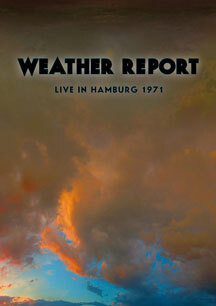 Weather Report: Live In Hamburg 1971 has been released on NTSC DVD suitable for playback on US DVD players. This DVD documents the original incarnation of the band with Miroslav Vitous, Alphonse Mouzon and Dom Um Romao. Originally recorded for broadcast on the German television program “Beat Club,” the video and audio quality are excellent (although it was recorded in mono). The set clocks in at 48 minutes and includes performances of “Orange Lady,” “Directions,” “Seventh Arrow,” “Waterfall” and “Dr. Honoris Causa.” This is a rare glimpse at the band in its earliest days, and not be missed by Weather Report fans. “If you study the title, it has little fragments of the names of five or six really influential jazz-rock fusion bands, like Larry Coryell’s Eleventh House, Miles Davis of course, Mahavishnu Orchestra, the Tony Williams Lifetime, Return to Forever, and Weather Report,” he explains. “And that tune, if you listen to it really carefully, you’ll hear elements of all those bands—although to me it sounds more like Weather Report than anybody. Really? Corea wouldn’t be bothered by this well-deserved nod to the late Joe Zawinul, would he?